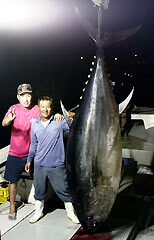 Hiroyuki Hirayama (on the left) who landed a giant bluefin tuna and Takashi Nakamichi, captain of Taka Maru, celebrating together at Kanegusuku Port on Kumejima Island on June 16. On June 16, off Kumejima Island, which is now in the middle of its fishing season, 45 year-old Hiroyuki Hirayama from Nagoya, Aichi Prefecture, caught a giant bluefin tuna weighing 286 kilograms and measuring 2.6 meters in length. Hirayama returned to Kanegusuku port, where locals who had heard the news gathered and applauded his achievement, very happy at the sight of the shiny black tuna with its massive body. While Hirayama was trolling with live bonito as bait under the guidance of the Taka Maru (Captain Takashi Nakamichi), a vessel belonging to the Fisheries Cooperative Association of Kumejima Island, he finally got a bite at 12:20pm. After about a six-hour struggle, the Nagoya man finally caught the fish.